Months and months and months ago, I bought some striped fabric from Girl Charlee that made me swoon. SO soft and SO fun, this fabric needed the exact perfect pattern. I wish I could put a swatch of this through the internet. It's cotton/modal and so. soft. so. drapey. LOVE. If I had had any idea how dreamy it was, I would have ordered more than a yard. See, sometimes I order fabric for AB and then it gets here and I change my mind and selfishly designate it for myself. Unfortunately, that means I end up with small yardage and big ideas. I have been dying to sew this up into a very specific look. Kimono-sleeved boatneck top. I don't know why. The fabric talked to me and that's what it said. Just call me The Fabric Whisperer. I've been searching high and low for a pattern (more on my kimono sleeve obsession here and here) but I haven't been able to find the perfect look. Until now! I buy a lot of striped fabric, and not only will this pattern work for my dream neon stripey knit, but it will work for all my other stripes. Yes, this is a dress pattern, but it does not appear to be difficult to shorten into a top if I have limited yardage. Before cutting into my black stripes, I made a wearable muslin from some orange and white graffiti stripe jersey that I got from Girl Charlee (at the same time, actually). FYI I'm wearing a slip here. My original intention was to make this pattern exactly as specified (with a keyhole cut-out in the back and with neckline facings) but I ended up going off track. I didn't have enough fabric for facings (and I was concerned about facings in stripes since the fabric is a tad sheer) so I abandoned that idea. I also had to ignore the keyhole idea since I couldn't do facings. 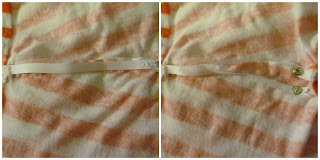 To finish the neckline I simply folded it down over clear elastic and topstitched. I omitted the pockets for fabric reasons and because I had half a notion to make it a top. This is marked as a One Hour Pattern, but it took me longer than that because I was matching up stripes. Because of the keyhole, the pattern has you cut 2 back pieces so that you have a center back seam, rather than cutting the back on the fold. I hadn't yet decided to forget about the keyhole, so I did give myself extra work with a CB seam (and therefore with more stripe matching). 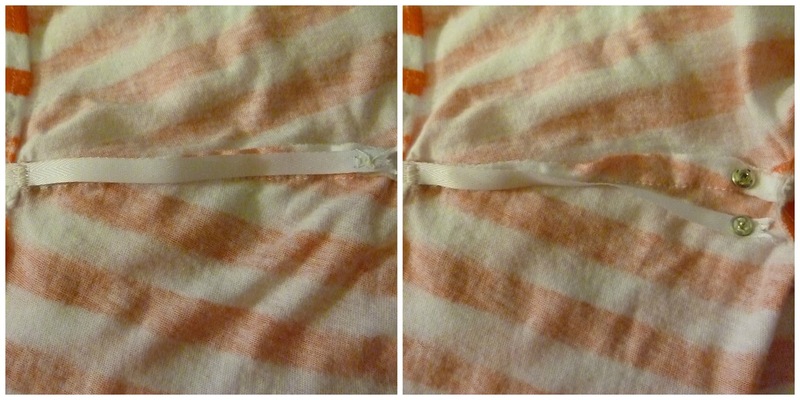 The only way I can match stripes well is to pin like crazy, baste, check the stripes, then sew the real seam. Once it was sewn up, I couldn't bear to shorten it into a top. It's now a sort of mini-dress/tunic length. I won't wear it without a slip, leggings, or skinny jeans in the winter. The boatneck does break my number one rule by preventing easy nursing access, but I just try to plan ahead and not get caught in any awkward situations. It also goes well with capri leggings and a black leather belt. 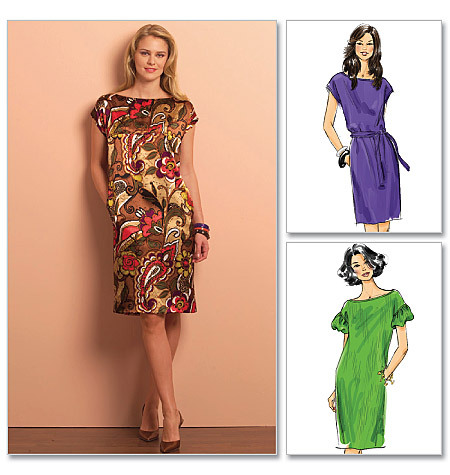 It's pretty darn shapeless without a belt, so don't even start on this pattern unless you have a belt to wear with it. The pattern includes instructions for a self belt, if you have enough fabric. It has the hanger appeal of a bedsheet. My husband says this tunic looks like pajamas. Even when I properly style it. "It's a matter of taste" as Tim Gunn would say. Good thing I'm not making it for my husband to wear. One other thing I did to make this top fabulous was to add bra carriers. These were super easy to make and have such a huge impact on my comfort/confidence while wearing. A bra carrier is just a piece of ribbon or twill tape sewn to the inside of the garment shoulders, with a snap on one end. You slide your bra straps into the carriers and then snap it closed, resulting in straps staying put under your clothes, an important concept when wearing a wide-necked look like a boatneck. Now the real question is: will I hurry and sew up the neon stripe knit with this pattern? I got it off my shelf to throw in the washing machine...and I couldn't do it. I couldn't commit. I've talked myself into making some other things first. Anyone else suffer from can't-bear-to-use-it-fabric-itis? What's the cure?